Sustainability started for our family in a rather selfish way. We got married right before I went to grad school and it was my first time living on my own without my parents helping me. I basically freaked out and thought we were going to super poor and not be able to pay our bills (I apparently struggled with trusting that God would take care of us). So I started researching non-stop how to save money like a crazy person. Most of the time saving money and being more sustainable went hand in hand. Some things though did cost a little more money and I had to learn where to save, where to splurge, and when an upfront cost would be beneficial in the long run. The more research I did the more apparent it became that we wanted to try to live more sustainably. We are still not perfect, nor will we ever be, but we are changing and learning to balance being more sustainable while living a real life. Reduce waste: Our culture is so wasteful! We buy plastic water bottles, paper products, our food is packaged, fancy coffee (although I do love an occasional pumpkin spice latte), you name it we probably throw it away. Most of the time we can use reusable items. We have managed to reduce our trash to 1 garbage bag a week! Yes one! Between bringing a non disposable lunch, rarely using paper products (cloth is where it’s at people), recycling, and feeding our chickens lots of scraps we have has decreased the mount of trash we have by a lot. Plus, the less trash you use the less often you have to take it out! Who doesn’t love that? Use reusable diapers and baby wipes at much as possible! Our very own Libby does! Your wallet will thank you too! Have gross water? We sure do! You can get a Berkey water system or refill a reusable container, and fill up a water bottle rather than buying new plastic ones (which cost a ton of money over time). Avoid plastic as much as possible: Plastic is not a renewable resource nor it good for us (I’m suspicious of BPA free plastic too) , so when we can, we try to avoid it as much as possible. Making your own food from scratch is a great way. The less processed foods you buy the less plastic you are probably going to use. Think about it… even the organic fruits and vegetables you buy from the frozen section are probably packaged in plastic. 99% of the time I take pyrex dishes, reusable sandwich bags, and metal utensils with me to work in my reusable lunch bag. I rarely ever have to throw away anything when I’m done! I also use a glass water bottle. Recycle: Although this seems obvious, there are tons of people that still do not do this! We don’t have recycling pick up in our town, so we collect all our recycling in a cute bin and bring it to a local recycling place. My work even has recycling drop off making it easy to do. Eat real food! 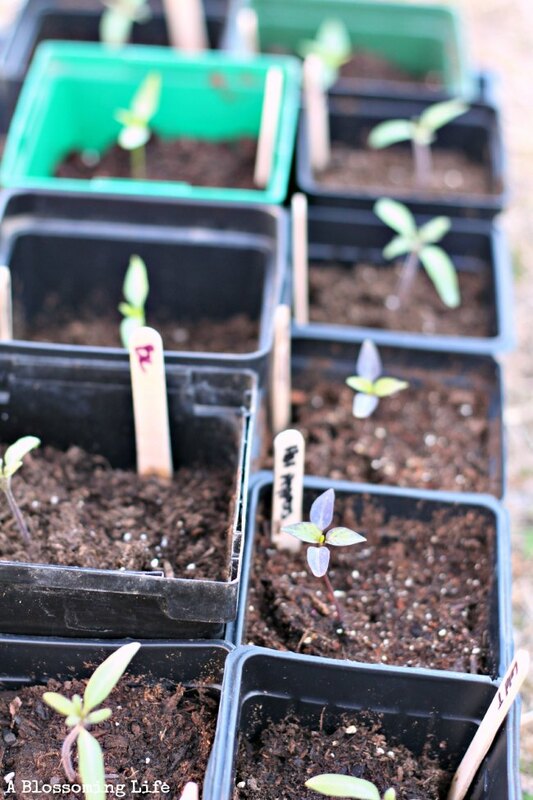 : Plant a garden (click here for great info to start a raised bed garden) , shop at the farmers market and purchase local fruits, vegetables, meats, eggs, dairy, and grains whenever and as much as possible. This cuts down on transportation costs and you will be eating fresher more nutritious foods. Limit the amount of processed foods and incorporate batch/freezer cooking as much as possible. 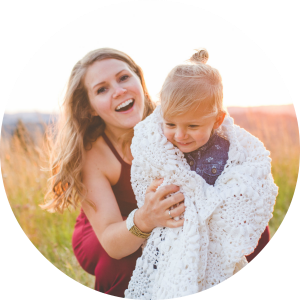 Live Simply share great tips to Saving Money On Real Food, she also shares her 2 week meal plan 2x per month. Recently, we started getting local meat through a local farmer by going in on a meat run with a group of people. Basically, one of our friends goes to pick up meat for at least 10 people 2x a month. This saves us money and gas! We also do this with raw milk. 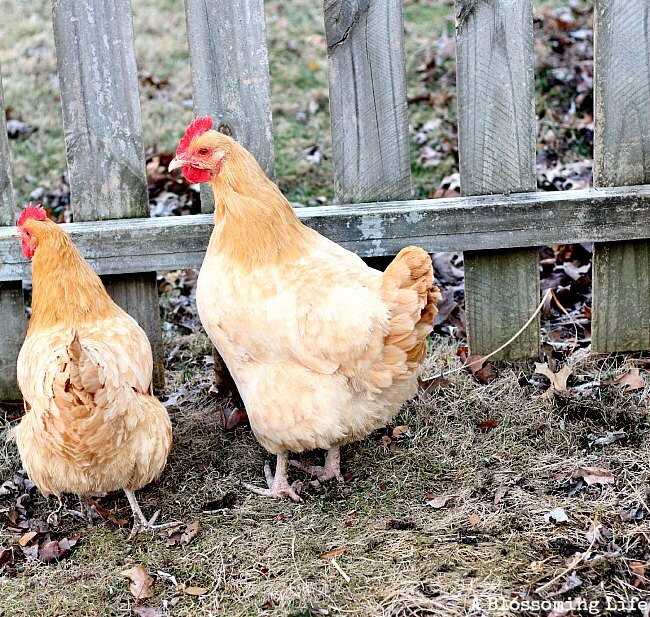 Get a backyard flock: This is a new one for us, but I have loved everything about it! Chickens are super helpful. Not only do they give you nutritious fresh eggs daily, but they also compost, and create amazing dirt for your garden. Having your own chickens allows your to not purchase and promote factory farming! Don’t think you have room? There are lots of people, like myself, that have chickens on less that .20 of an acre! If you can’t have chickens try to source your meat and/or eggs from a local farmer. Reduce your use of fossil fuels: Limiting plastic helps but how about reducing how much you use your car, try to make a trip to the store on your way home from work, or only go 2x a month, carpool to work, walk to the park or nearby places (we walk to drop off some of a bills that our down the street). One way I’m saving fossil fuels is by my new Fiskars Reel Lawn Mower ! I keep talking about how excited I am, but friends this is really exciting! In our house I do the yard work were my hubby does a lot of the cleaning inside (switched roles 🙂 but thats what we enjoy doing. But I told him I didn’t want to mow the yard if I had to use a gas mower. It was really more of a fear of engines and stuff plus buying gas. So we bought the new mower which wasn’t too expensive and in the long run will save us money! Plus, its fun and easy to use! My neighbor is even excited about it and said she wanted to steel it and give it a whirl. You can also find new ways to save money on household bills. Change all your lightbulbs for more efficient ones, make sure you don’t leave lights on, line dry clothes, block door/window drafts, set the temp cooler in winter and warmer in summer, use a wood burning stove to head the house, etc. Start an herbal medicine cabinet: Learning to heal naturally helps you save money (especially when you grow herbs yourself). The Mine to Homestead shares great tips to start your own DIY Basic Natural Medicine Cabinet, 5 Herbs to Use Around the House and Homestead, and Battling Perimenopause Naturally. Learn to make homemade products: Start making your own skincare, makeup, cleaning supplies, soap, shampoo, you name it you can probably do it yourself. You will save money and can avoid harmful chemicals! 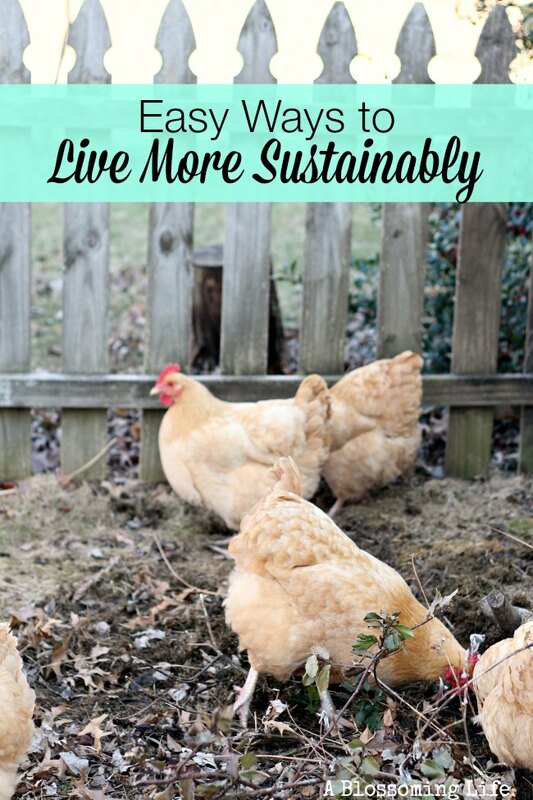 What are some ways you try to live more sustainably? 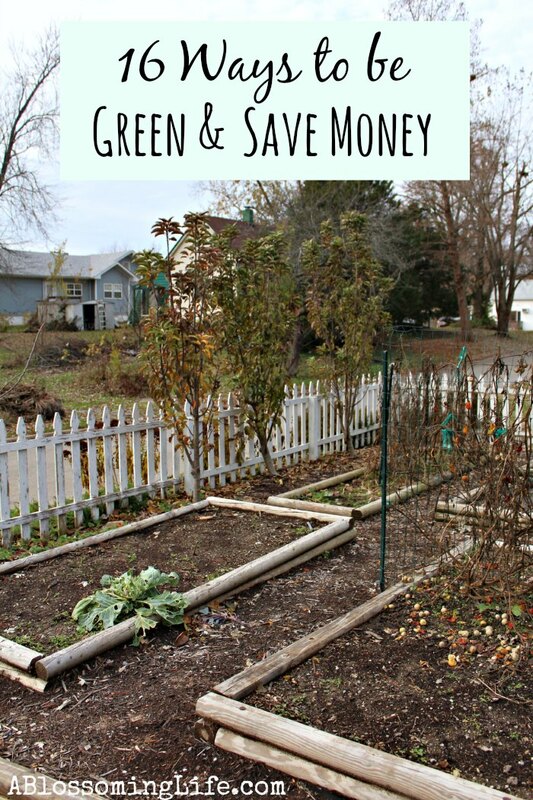 Here I shared 16 ways to be green and save money! Which was really a list of my sustainability goals this year! This post contains affiliate links to help support my blogging. I enjoyed this post! I love how being frugal doesn’t just save money, but it’s usually healthier and less wasteful at the same time! Good post! It’s nice to see how many small changes can make a difference. It does amuse me though how big the difference between the US and the Netherlands is. One bag of trash each week? Gosh, we only put our trash bags out maybe twice a year. Of course the difference probably is that most of our trash is recycable: plastic is picked up seperately, as are dairy cartons, cans, organic waste and paper. So there’s really not much left that goes into the “normal” trash. Things like broken furniture might. I’m not sure if in the US these things are picked out of the general trash, or that everything still ends up in one gigantic trash pile to burn?